Note: In a multi-node installation, you manage the whole Qlik Sense site from the QMC on the central node. You can access the QMC from rim nodes, but requests from the QMC towards the repository are routed to the repository on the central node. 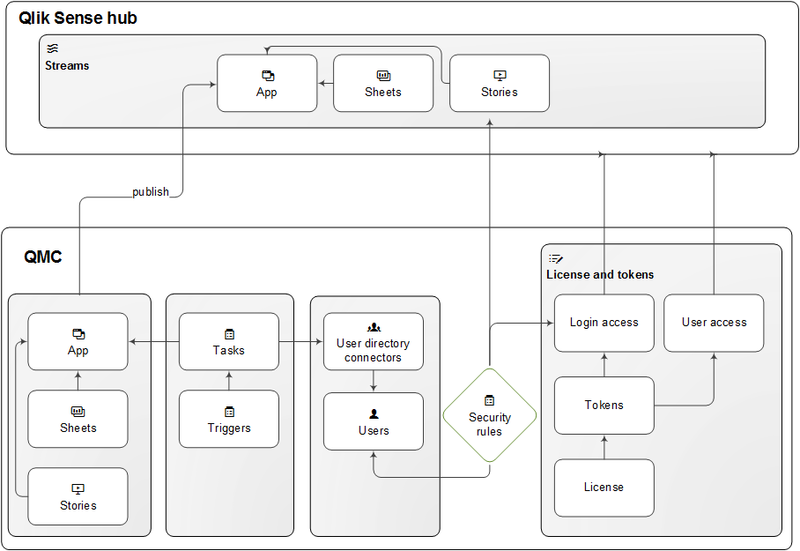 You can create and publish apps to streams from the Qlik Sense hub, if you have the appropriate access rights. Apps can also be published from the QMC. To publish an app that is created in a Qlik Sense Desktop installation, you must first import it, from the QMC. The security rules applied to the app, stream, or user, determine who can access the content and what the user is allowed to do. The app is locked when published. Content can be added to a published app through the Qlik Sense hub in a server deployment, but content that was published with the original app cannot be edited. Apps can only be deleted from the apps overview page of the QMC. The resources in the QMC have an associative structure. This makes it easy for you to navigate between the different resources in the QMC. Because of the associative structure of the QMC, you can select a resource in more than one way. For example, you can select an app either from the apps overview or from the Associated items for the stream that the app belongs to. Similarly, you can select a task either from the tasks overview or from the Associated items for the app that the task belongs to. On the QMC audit page, you can query for resources and users, and audit the security rules, load balancing rules, or license rules that have been defined in the Qlik Sense system. In the QMC, you can create customized properties that you can connect to resources. The main purpose of custom properties is to use them in the security rules. You can also create and connect QMC tags that can be used for filtering on the overview page of a resource. Tags cannot be used in the security rules. Create a custom property called Departments with values appropriate to your organization. Apply the custom property to your streams and you can then apply security rules to streams according to their Departments property instead of managing security rules for individual streams. Tip: Group memberships are uploaded to the central repository when you create and synchronize a user directory connector. This means that you can apply security rules to group memberships instead of defining and applying custom properties to users. You can manage security rules for all data connections from the QMC. Users can create data connections from Qlik Sense but the sharing of data connections (security rules) is managed from the QMC. You can select several resources from the overview. By doing this, you can edit or delete multiple resources at the same time. This makes your QMC administration work more efficient. You can create and publish apps to streams from the Qlik Sense hub, if you have the appropriate access rights. Apps can also be published from the QMC. To publish an app that is created in a Qlik Sense Desktop installation, you must first import it, from the QMC. The security rules applied to the app, stream, or user, determine who can access the content and what the user is allowed to do. The app is locked when published. Content can be added to a published app through the Qlik Sense hub in a server deployment, but content that was published with the original app cannot be edited. By default, Qlik Sense includes two streams: Everyone and Monitoring apps. Note: All authenticated users have read and publish rights to the Everyone stream and all anonymous users read-only rights. Note: Three of the predefined admin roles (RootAdmin, ContentAdmin, and SecurityAdmin), have read and publish rights to the Monitoring apps stream. Content security is a critical aspect of setting up and managing your Qlik Sense system. The QMC enables you to centrally create and manage security rules for all your Qlik Sense resources. Security rules define what a user is allowed to do with a resource, for example read, update, create, or delete. By design, security rules are written to include, not exclude, users. Users who are not included in security rules are denied access. Therefore, security rules must be created to enable users to interact with Qlik Sense content, data connections, and other resources. Note: The QMC includes pre-defined administrator roles, including the RootAdmin user who has full access rights to the Qlik Sense system, which allows the RootAdmin user to set up security rules. The License Enabler File (LEF) defines the terms of your license and the access types that you can allocate to users. There are two license types: one that is user-based and one that is token-based. User-based license: you can allocate professional access and analyzer access. The LEF determines the distribution of the two access types. Token-based license: you can allocate user access and login access. The LEF determines the number of tokens that you can allocate to the two access types. An access type allows users to access streams and apps within a Qlik Sense site. Note: If you want to set up Qlik Cloud Services or Qlik Sense Enterprise for elastic deployments, please contact your Qlik representative or Qlik Support to obtain an updated LEF that is required for the setup. Each access type provides the Qlik Sense user with a certain type of access to Qlik Sense apps. A user with no access type cannot see any streams. Note: Application access only grants access to app objects in mashups, and not to the Qlik Sense hub or streams. All user data is stored in the Qlik Sense Repository Service (QRS) database. You create user directory connectors in the QMC to be able to synchronize and retrieve the user data from a configured directory service. When a user logs in to Qlik Sense or the QMC, the user data is automatically retrieved. You can change the authentication method that handles the authentication of the Qlik Sense users. The creator of a resource (for example, an app or a stream) is by default the owner of the resource. You can change the ownership for resources in the QMC. The following illustration gives an overview of the workflow of the resources. The apps, sheets, and stories are created from the Qlik Sense hub. Apps are published to streams from the Qlik Sense hub or from the QMC. Tasks are available for apps and user directory connectors. The reload task is used to fully reload the data in an app from the source. The user sync task is applied to a user directory connector to synchronize the users from a user directory. Triggers can execute tasks. A stream security rule is applied to the stream and affects the access rights for the users. Token-based license: The site license provides for a number of tokens that are allocated to access types. Users are given access to streams and apps on the hub by login access or user access. A security rule is applied to the login access to specify which users the login access is available for. User-based license: The site license provides for a number of professional and analyzer access allocations. Users are given access to streams and apps on the hub by their access. Note: The hub is not a part of the QMC. The hub is where Qlik Sense apps and sheets are opened and managed.